Around this time, I was just doing electrical work. In the previous article, I wrote that to control the LED using with the Arduino and another new device. 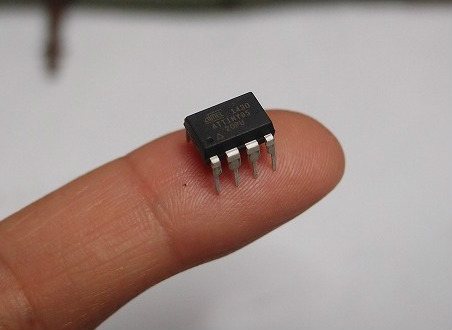 This small tip is named AtTiny85, and this is also a programmable microcomputer. At this time, Arduino control the 2 LED for the engine, and supplies power to the AtTiny. AtTiny controls the blinking of the wing-tip light. To connect the Arduino to the PC, and connect the AtTiny to Arduino, I tried to check the operation. Next time, I will install the Arduino and AtTiny in Arcadia.